The kingdom of Gemstones is where magic and science coexist (though not without conflict). Legend tells of twelve precious gemstones that were stored in a sanctuary on the land, and their presence was said to have brought peace and prosperity to the kingdom. These legends also claim they were even capable of granting people's dearest wishes. Five centuries ago, however the gems were stolen by the bandit Grossular, and disappeared without a trace. As a result, the balance of trust among the populace was lost, and the kingdom's government was replaced by a state of powerful magic-users. These sorcerers proceeded to rule the land with an iron fist, the poor citizens now left despondent, having lost their hopes and dreams with the theft of the gems. Hundreds of years have passed, and now the stones are in new hands - mysterious hands! These twelve individuals are now hunting down the remaining gems not in their possession in an attempt to make their desires come true, for good or for ill.
 Alternately parsed Gem Stones or GEMSTONES, depending on the source. The Puchi Carat Official Guide Book is the only source to name the sanctuary: it is called the Optical Temple. 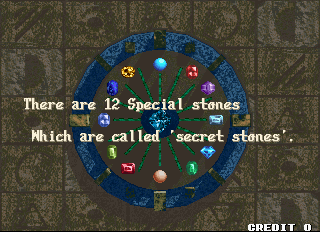 The English PlayStation manual claims the gems fell into the hands of the sorcerers during this period, though this may be a mistranslation. With a story like that, you'd expect some kind of RPG affair with turned-based battles and battle axes and that kind of cliché. Instead, Puchi Carat (プチカラット) boasts a style of gameplay that can the marketing materials dub action-puzzle, and be quickly summed up as Breakout meets gravity. You've got a ball, a paddle, and an a continually-descending array of bricks at the top, and your goal is to break them down - preferrably by attacking the roots to score big combos and rack up huge excess block chains. It's furious, it's fast-paced, and best of all, it's competitive. No longer just a single-player affair, a huge draw of the game is trying to defeat an opponent in the art of brick-breaking. The more blocks you knock off, the more junk bricks are sent to your opponent's screen, and vice versa. You can play dangerously by intentionally getting more blocks on-screen, allowing you to send a much stronger attack if you strike it lucky, or you can play it safe but run the risk of your opponent swamping your screen. Oh, and the whole time you've got giant screen-filling anime characters jigging and dancing in the background, squealing in excitement or dismay at your varying conditions, and ultimately making the whole game very distracting. It could be seen as needless, but it is what gives the game a lot of its unique and quirky charm. It's got simple yet engaging gameplay, great graphics, and a surprising amount of backstory for a game all about batting a ball at bricks. It's got something for everyone! So why didn't it take off? Well... when's the last time any puzzle game took off, especially in the 90s? That, and it didn't get any kind of console port in America until a decade after its release. The game was simply overshadowed by other hits, particularly the Pokémon boom, and the fact that arcades were beginning to die out on English shores clearly didn't help matters. Heck, the game barely had any decent internet coverage for years - you wouldn't believe how crummy the Wikipedia entry was for so long. I felt it necessary to take action. This shrine, originally titled the Puchi Carat Palace (with a really crummy logo to boot), was first uploaded on June 23 2008. I'd just been reintroduced to the game through Taito Legends 2, and I had plenty of time to kill, so why not write a bunch of stuff about the game? Come May 2011, I made a start on revamping it to its current appearance, with the intention of cataloguing as much information about the game and its environment as one frighteningly obsessed nerd humanly could. Like, moreso than before. Perhaps one of the most notable characteristics of Puchi Carat is that the translation is very rarely consistent between the three versions, or even with itself! You could say the only thing shared between them all is the very rough and spotty translation job. Names change, spelling and formatting errors are frequent, and if I knew what the original Japanese text was like I'd probably declare it an insult or something, but I'm in no position to critique. All of the English dialogue transcribed on the site is exactly as extracted via text dumping; all in-game errors are untouched, though they might be missing the likes of emoticons and whatnot. The Game Boy version has a problem with occasionally assigning dialogue to the wrong icon; I've done my best to try and rectify that whenever possible. There are a few ways to translate each character's name, but I try and stick to the names that closest resemble their gemstone. Hence, although pronounced "Ruco", I choose to refer to that character as Rquo. As for everything else? Anything goes! The location names have multiple dodgy translations that consistently fail to mimic the object they're named after, so... I just try and keep up. I'd ask you to pardon the errors, but I'm only keeping up tradition at this point.